C&G Partners was responsible for concept design and development for the visitor experience, encompassing about 60 new exhibits as well as graphic design in the architecture and landscape. 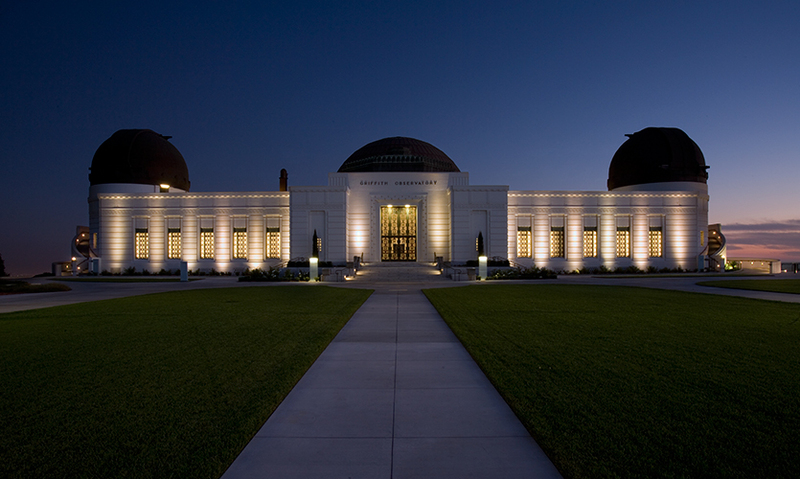 A six-year collaboration with the Observatory and project architects Pfeiffer Partners maximized integration between architecture and graphics. 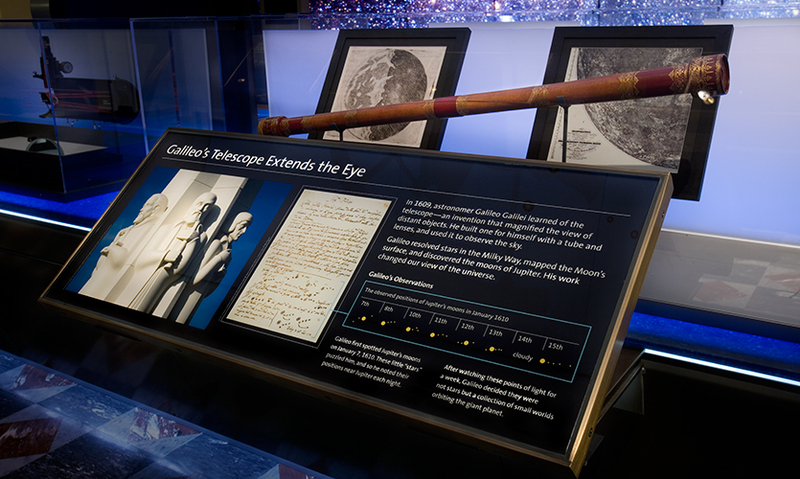 C&G Partners based all its design work on three overlapping goals: promote observation as the Observatory's core mission; make astronomy interesting to visitors; and illuminate the rich astronomical heritage of the region. To meet those goals, the team designed a series of "grand visual gestures" and interactive media that provide visual punch and engage visitors without asking them to read wordy text panels. 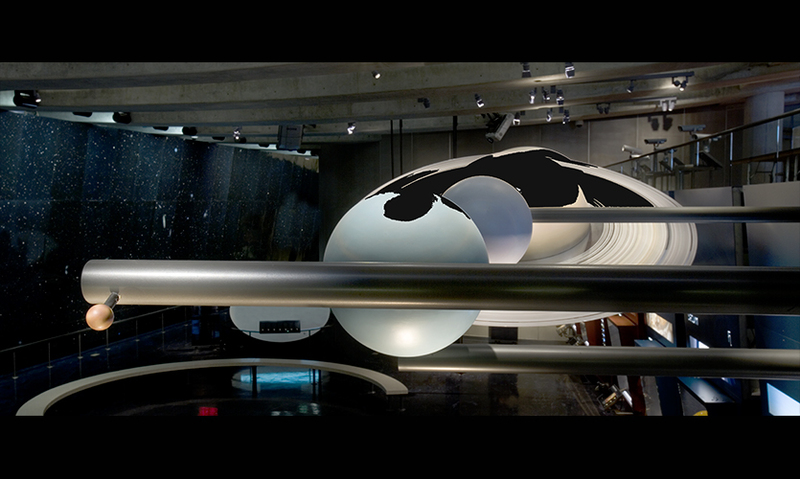 A scale model of the solar system fills the upper reaches of the cavernous "Depths of Space" exhibit hall, hung as if the adjacent circular theater was the sun. A 150-ft.-long porcelain enamel mural called "The Big Picture" reproduces the largest space photograph ever taken, encompassing 1.7 million stars and galaxies. Across from the mural, a life-size bronze statue of Albert Einstein shows him holding up his arm, index finger and thumb raised to illustrate that the mural represents about 1 inch, or 1/1000th of the visible sky. Large-scale photography and ambient video surfaces appear in unusual places, at uncommon angles, to reinforce the message of observation. An overscaled periodic table of the elements illustrates how most elements originate in space. 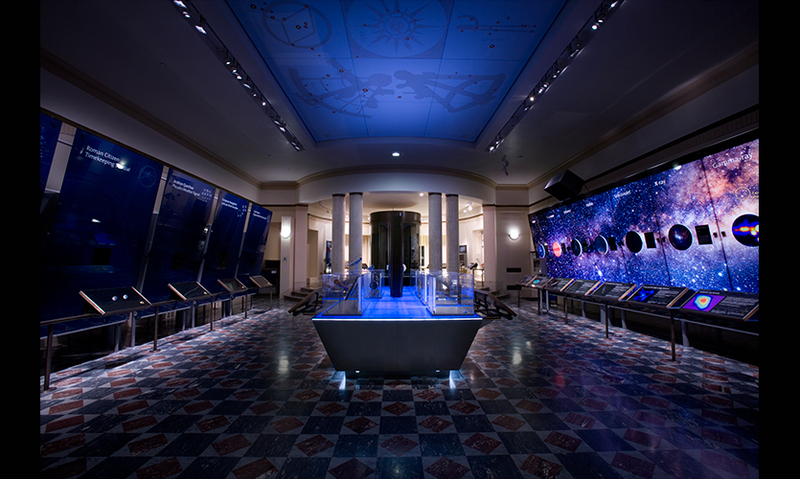 The dramatic "Hall of the Eye" is dedicated to the history of astronomy and astronomical instruments, illustrating how mankind has and continues to benefit from looking to the stars. "Astronomical scale meets humanistic observation. The complexity of the visitor center could have easily been overwhelmed by the scale of the undertaking or lost in technological media. Where the project succeeds is in the orchestration of all the components of exhibitry, multimedia, and environmental graphics. The porcelain enamel star mural is a dramatic backdrop to large-scale planetary replicas. Typographical narrative marries with scientific symbol, and large-format muralistic photography pairs with plasma-screen presentation. 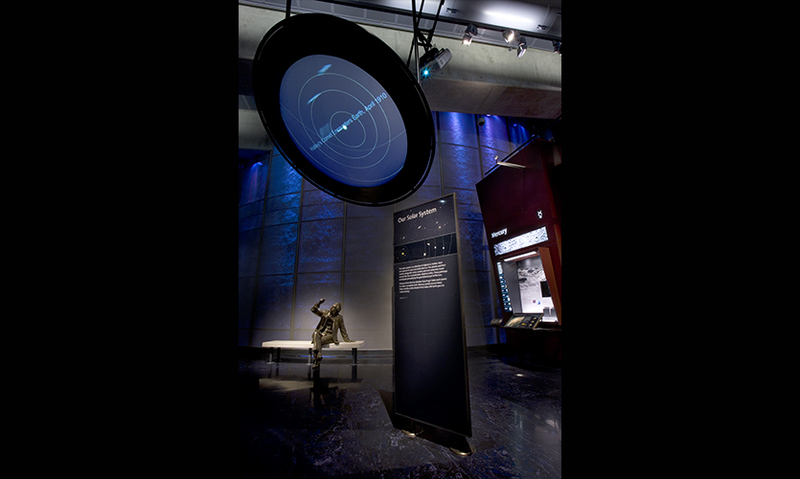 An overhead data projection screen floats above a life-sized bronze sculpture of Albert Einstein." 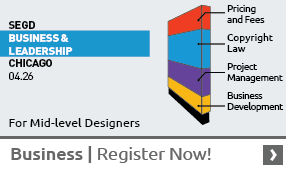 "What is less evident to the average visitor is the collaboration between exhibit designers and lighting designers, audio/visual consultants, structural engineers, and scientific curators. 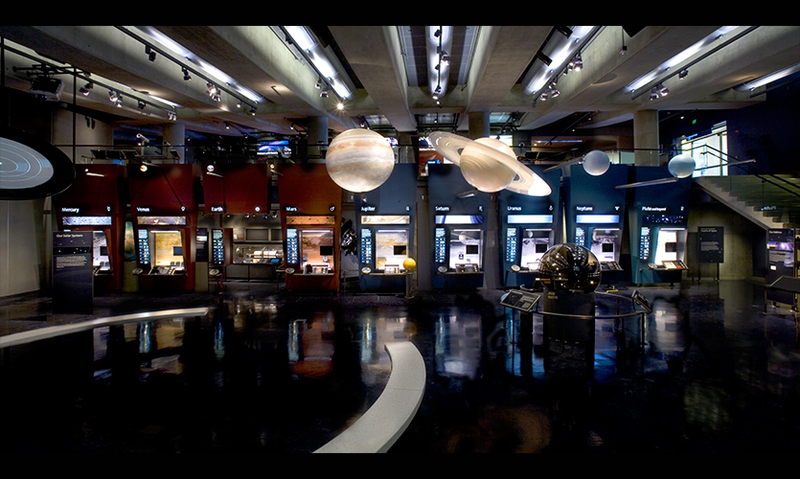 Faux planets hang above real asteroids, and replications mate with real artifacts. What could have been overtly dark and dominated by blackness is successfully lit and colorful. Historical diagrams and magical imagery of the present day are tied together with approachable type diagram and layout. 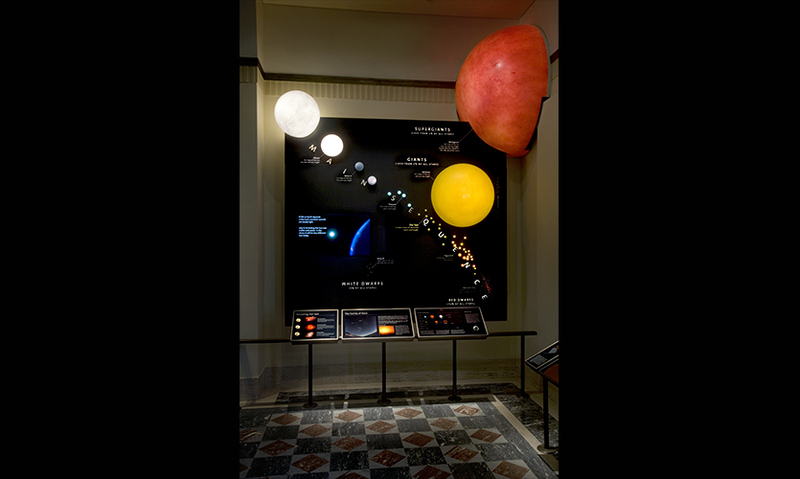 Griffith has created a successful immersive environment engaging visitors in an inspiring subject—turning earthbound visitors into observers of the universe."